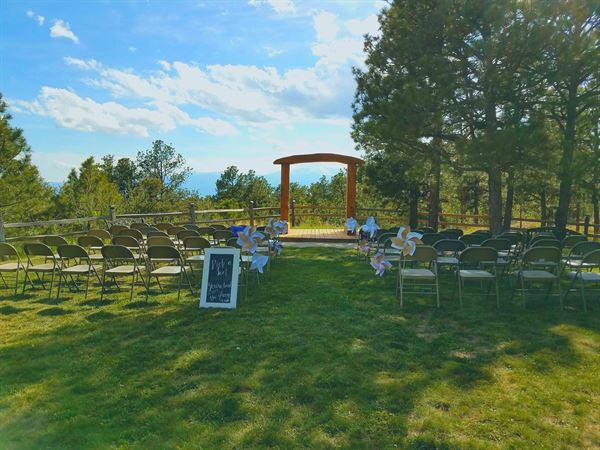 We have a gazebo for ceremonies with Pikes Peak and pine trees as your backdrop. A spacious wedding meadow and new 1,000 sq. ft. log pavilion for receptions, large patios, indoor pool, a spacious atrium guest house for your smaller in-door receptions. The newly remodeled Lodge now has a dance floor and baby grand piano along 50' of sliding doors over looking the pines, city lights and Rocky Mountains. This versatile area is ideal for weddings, reunions, retreats, small business conferences and even piano recitals! The lounge area has comfy futon sofas, a romantic fireplace, satellite TV/VCR, a full kitchen, full bath and an adjoining laundry room. 1,000 sq ft Log Pavilion is available for your outdoor functions. My niece's wedding was held at Black Forest outside with the beautiful background of Pike's Peak. The owner was so kind and constantly checking to see if he could help in any way. I was very impressed. Definitely memories to remember.